Henry Charles Lea was a Philadelphia publisher, civic reformer and America’s first distinguished historian of the European Middle Ages. Anthony Wayne, of course, was the famous Pennsylvania general who commanded the Pennsylvania Line at the battles of Brandywine, Paoli and Germantown, played an important part in the Battle of Monmouth and gained fame for leading a night bayonet attack on Stony Point in July 1779. He went on to serve in the southern campaign after the victory at Yorktown, held state political office in Pennsylvania and was a U.S. Representative from Georgia and fought in the Northwest Indian war in 1793-94. He is buried in St. David’s churchyard on Valley Forge Road in Wayne, Pennsylvania. 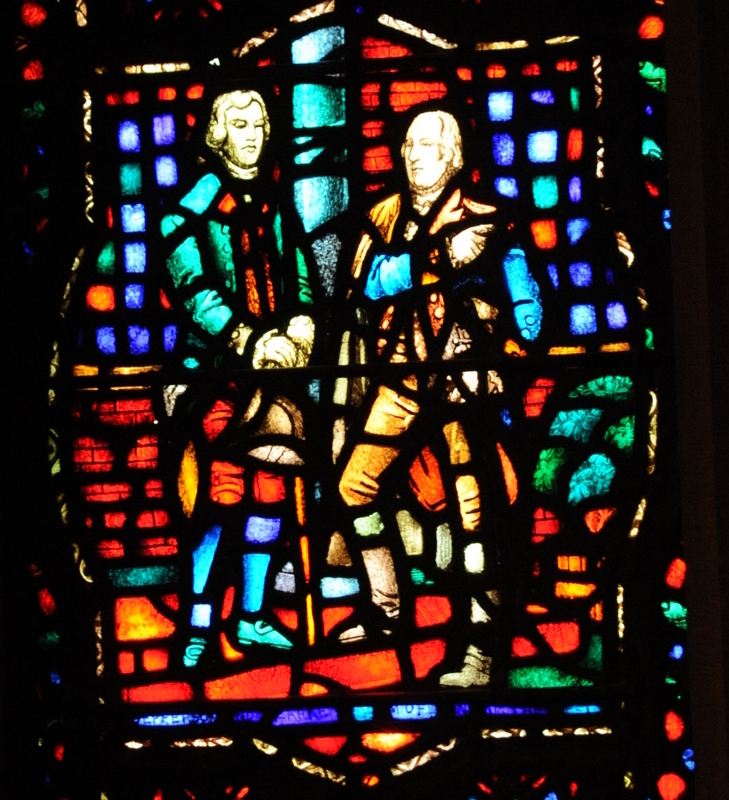 The theme of the Anthony Wayne window is American expansion. 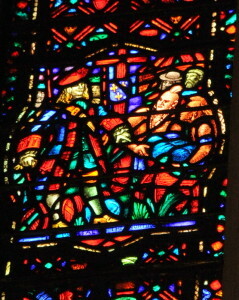 The companion text from the Bible is from the Gospel of St. Matthew, Chapter 13 verses 31-32, “The kingdom of heaven is like to a grain of mustard seed, which a man took and sowed in his field; which is indeed the least of all the seeds; but when it is grown it is the greatest among herbs, and becometh a tree, so that the birds of the air come and lodge in the branches thereof.” The predominant color of the window is red. 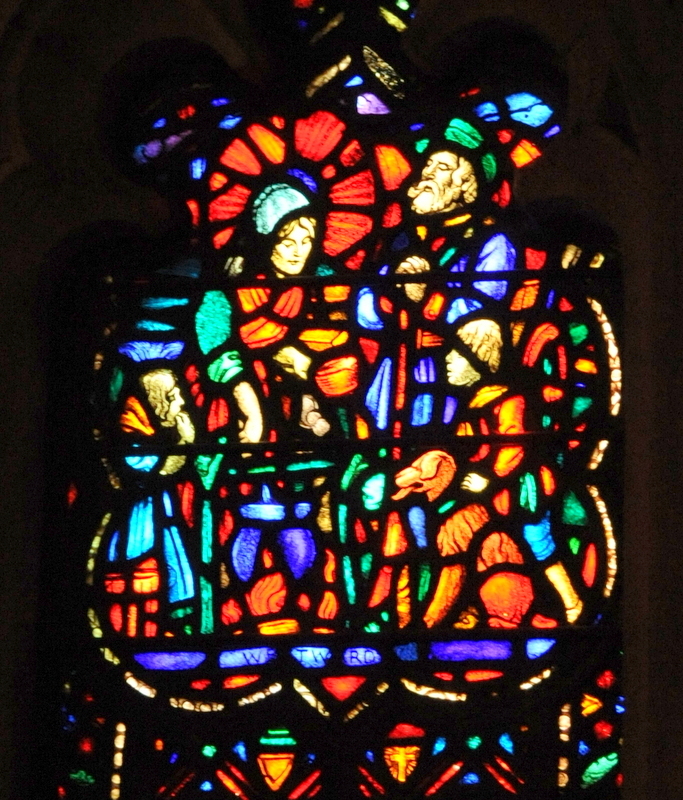 The window consists of twelve panes, each one depicting a separate, significant event in the expansion of America. 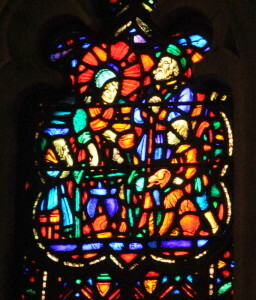 The panes read from left to right and top to bottom. Pane 1: Joliet and Marquette Reach the Mississippi. In October 1672, Louis de Buade, Governor and Lieutenant General of New France (now Canada) selected Louis Joliet, a native-born French Canadian, and Father Jacques Marquette to find the great river to the west of whose marvels the Indians spoke. Crossing Lake Michigan to Green Bay in May 1673, they reached the Mississippi via the Fox and the Wisconsin Rivers on 17 June and continued down the river to the mouth of the Arkansas River, about 435 miles from the Gulf of Mexico. 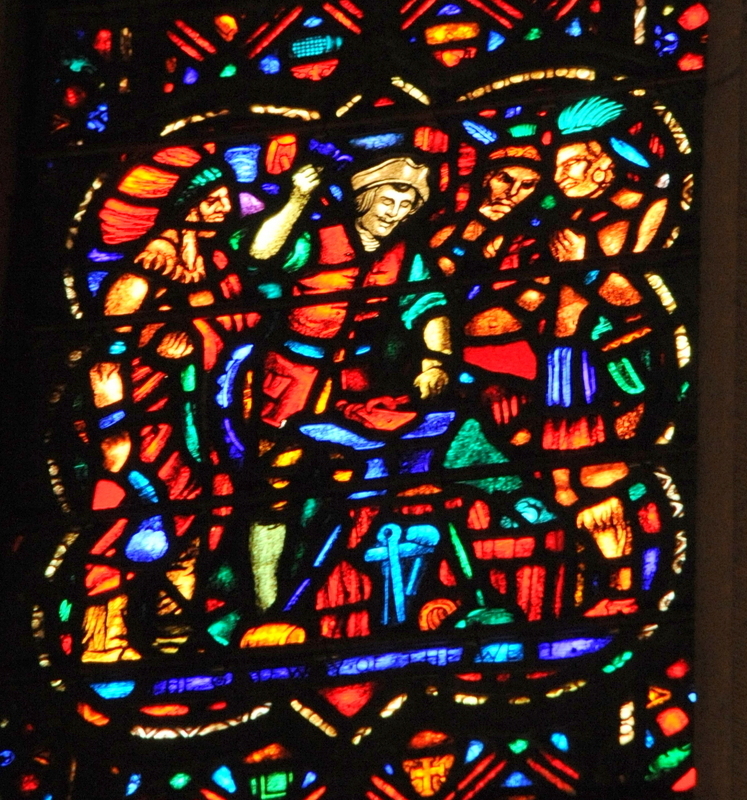 The window shows Joliet in the bow of his canoe, which is pointed south, followed by the bow of Marquette’s canoe. Pane 2: The Sailing of the Griffin. Robert Cavalier, Sieur de La Salle, built The Griffin (or Le Griffon in French) on the shore of Lake Ontario in the winter of 1679. Charged by Louis XIV with finding a route to Mexico, La Salle intended to use the vessel to transport and support his expedition to Green Bay from where he would begin his voyage of discovery down the Mississippi. The ship, the first decked European-built sailing vessel on the Great Lakes, set sail from Niagara on 7 August 1679, crossed Lake Erie and arrived at Green Bay in September 1679. 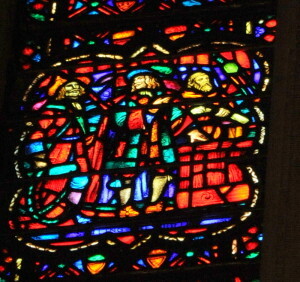 The window shows La Salle standing on the forward deck of the Griffin, with his lieutenant, Henri DeTonti on his left and Father Louis Hennepin, the Franciscan friar who accompanied them in the capacity of historian, holding a scroll. Pane 3: La Salle Opens the Way to the Gulf. La Salle’s expedition to the Gulf of Mexico, begun in 1679 was fraught with difficulty. The Griffin, sent back loaded with furs to pay for new supplies, disappeared, probably sinking in a storm. La Salle proceeded to the Illinois River, near present day Peoria, built a fort, Fort Crevecoeur, the first European settlement in Illinois in 1680, then returned to Canada for supplies. He returned to Fort Crevecoeur in late 1681 to find it destroyed by the Iroquois. He pushed on with a group of 20 Frenchmen and 30 Indians, down the Illinois River, reaching the Mississippi on 13 February and the Gulf of Mexico on April 9, 1682. 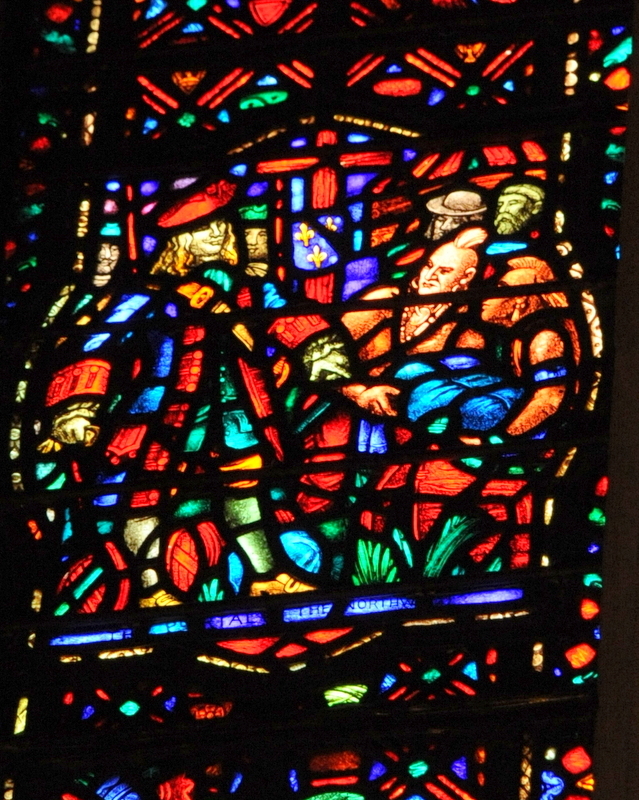 There he took possession of all the land drained by the Mississippi in the name of the King of France. 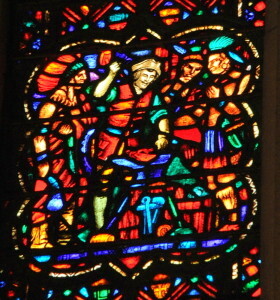 The window shows La Salle holding the royal patent received from the king, with a rude wooden cross on his right and a tree on which are nailed the arms of France on his left. Henri DeTonti is beside him, and on the shore in front are the listening (and doubtless puzzled) Indians. Pane 4: The Portal of the Northwest. 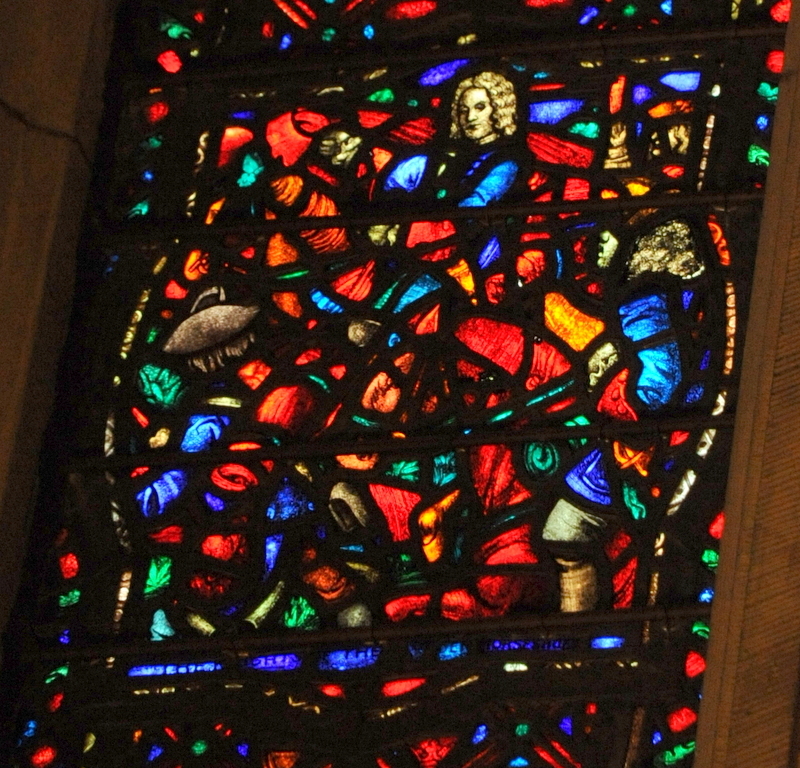 This window commemorates the founding of Detroit by Antoine de La Mothe, Sieur de Cadillac on 24 July 1701. Cadillac recognized the strategic importance of this spot for control of the northwest and built a fort there, Fort Pontchartrain du Detroit. 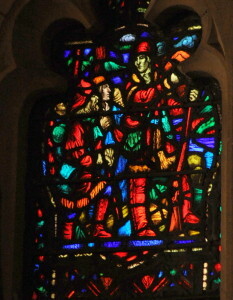 The window shows Cadillac directing the unloading of the canoes, the settlers looking on and the soldiers standing guard. The Iroquois Indians are watching from ambush. In the background is a wooden cross and on it the arms of France. Pane 5: The Knights of the Golden Horseshoe. The explorations and claims of the French in the Great Lakes and along the Mississippi and its tributaries caused some concern among the English colonists east of the Appalachians. Governor Spotswood of Virginia saw the French challenge as a potential threat. In a letter to the “Lords of Trade” he wrote, “to prevent the dangers which threaten his Majesty’s dominions here, . . . we should attempt to make some settlements on ye Lakes, and at the same time possess ourselves of those passes of the great Mountains . . .”In August 1716 Spotswood led a party of fifty gentlemen to explore west of the Blue Ridge. Crossing the Blue Ridge at Swift Run Gap, the party descended to the Shenandoah River. Spotswood claimed the Shenandoah River and all lands adjacent thereto for the King of England. It sparked English exploration of the West and laid the foundation for the English to contest French control of the interior. Following his return, Spotswood gave each of the gentlemen a golden horseshoe set with jewels and bearing the inscription “Sic jurat transcendere montes” (“Thus he swears to cross the mountains.”) The pane shows Lord Spotswood on horseback, leading the Knights. Pane 6: The Gateway of the West. This and the next two windows chronicle the struggle between the French and the English for control of the strategic junction of the Allegheny and Monongahela Rivers, the “Gateway of the West” where Pittsburgh stands today. Interestingly, they are out of chronological order. Rev. 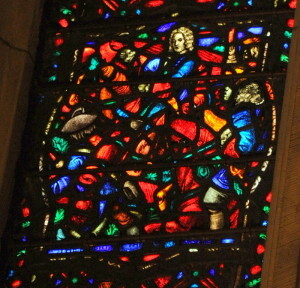 Burk had originally intended pane 8 to show Washington raising the British flag over Fort Duquesne in 1758 following its capture by the British. Instead, it shows Washington’s expedition to the Ohio country in 1753. In 1753 the French built Fort Le Boeuf on French Creek as part of a planned string of forts to deny the British access to the Ohio River Valley. George Washington, sent by the Governor Dinwiddie of Virginia in late 1753, protested this move in vain. An English expedition then erected a small stockade, Trent’s Fort, at the junction of the Allegheny and Monongahela Rivers, which the French seized in April 1754. In its place they built Fort Duquesne. 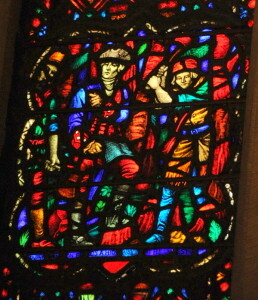 This pane, symbolizing French control of the Gateway of the West and the alliance with the Indians that made it possible, shows the smithy at Fort Duquesne with the French smith forging an iron tomahawk, and an Indian looking on. Two other Indians admire a completed tomahawk. Pane 7: Washington Builds the Highway to the West. The English Parliament ordered Governor Dinwiddie to build his own forts on the Ohio and to request the French, should they move forward, “to peaceably depart”. If they did not, he was to “drive them off by force of arms”. The Governor then raised an armed force, the Virginia Regiment, under the command of Col. Joshua Fry. George Washington, aged 22, was second in command with the rank of lieutenant colonel. They started from Alexandria, Virginia in early April, 1754 heading toward the Ohio to help Capt. Trent build forts and to defend the frontier. To reach Trent’s Fort with infantry, artillery and supplies required the construction of a road. Originally a path, then “Gist’s Trace”, this highway became “Washington’s Road”, “Braddock’s Road” and then the “Cumberland Pike”. Over it passed the thousands of settlers who built the west. 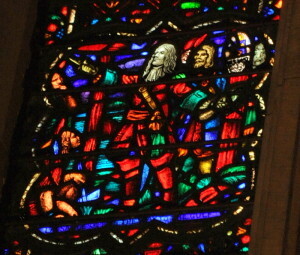 This pane shows Washington directing the axe-men felling the trees to open the highway to the West. Pane 8: Washington’s Mission to the Ohio. 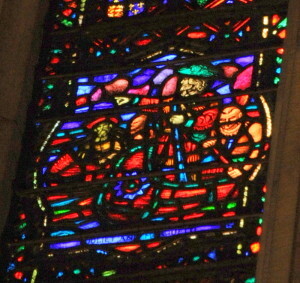 This pane, as noted above, should be the first in the series. In the early 1750s, Governor Dinwiddie of Virginia became concerned about French military activity along the Ohio River on Virginia’s western border and expressed his concerns to the British government. In August 1753 the Crown instructed Dinwiddie to send a expedition to the Ohio country to look into and report on French incursions. Washington, a Major in the Virginia militia volunteered to lead the expedition and from October 31, 1753 to January 16, 1754, traveled 900 miles, surveying the proposed site of Fort Trent, meeting with both Indian tribes and the French and presenting a letter to the French commander of Fort LeBoeuf demanding French withdrawal from the Ohio country. The French politely declined and Washington returned to Virginia. Governor Dinwiddie asked Washington to write a report of his expedition. The Journal of Major George Washington was published throughout the colonies and by year’s end in Britain. It won Washington international fame and raised British concerns over the French threat on their colonies’ western frontier. 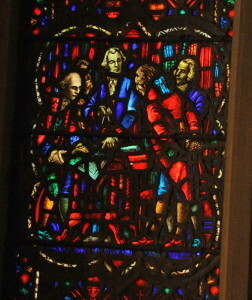 This pane shows Washington, one of his men and an Indian guide. 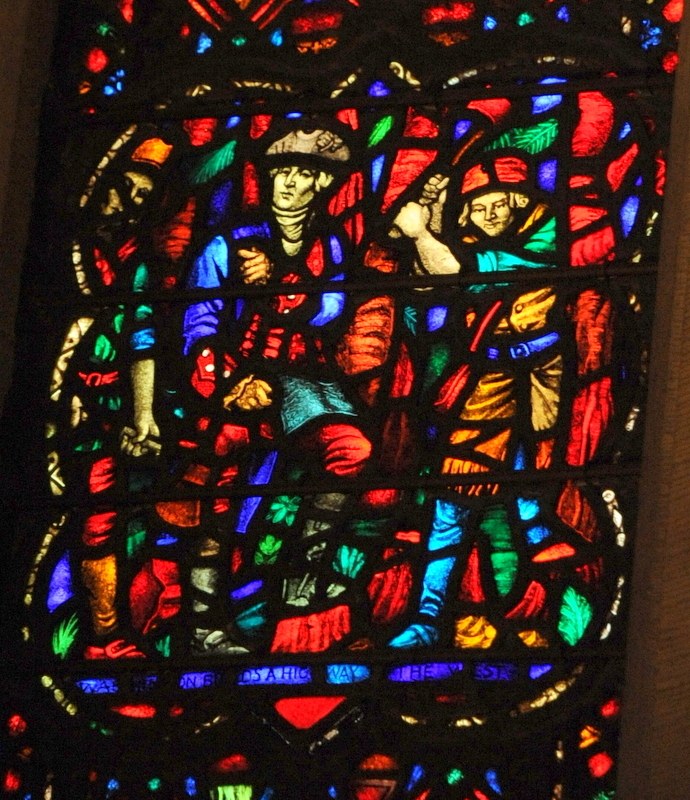 Pane 9: Daniel Boone Opens the Way Through the Mountains. Daniel Boone was born in 1734 in the Oley Valley near Reading, Pennsylvania. He moved with his parents and siblings to the Yadkin River Valley in North Carolina in 1750. He participated in the French and Indian War and in Braddock’s disastrous campaign in 1755. Having heard of the great wilderness to the west of the Appalachian Mountains, he crossed the mountains via the Ouasioto Gap and first entered what is now Kentucky in 1767. On 10 March 1775, in the employ of Judge Richard Henderson of North Carolina, he set out with 36 axe-men to cut a trail through the mountains and encourage settlement. This trail became known as the “Transylvania Trail” and was the route by which thousands of settlers moved west to Tennessee and Kentucky. 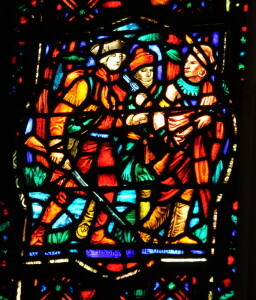 The pane shows Boone, rifle in hand, leading his men . Pane 10: Westward Ho! 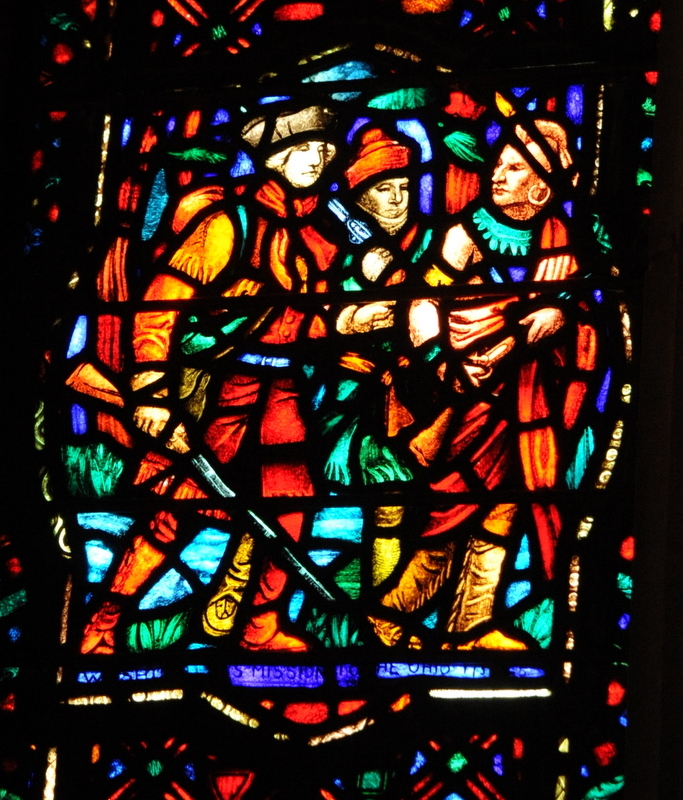 This pane shows no particular incident or individual, but rather symbolizes the westward migration of the early American settlers. In the background is the famous Conestoga wagon developed in Pennsylvania and used for freight once roads were built. It also figured prominently in the westward migration of the settlers. In the foreground is the pioneer family gathered around the campfire over which hangs the camp kettle. Pane 11: Washington Plans an Inland Waterway from the Atlantic to the Gulf. First as a young surveyor, later as a military officer involved in the campaigns of the French and Indian War, and then as an owner of huge tracts of land in the west, George Washington had become familiar with the vast territories to the west. He feared they would be controlled by the French and Spanish if they were not linked through trade to the East Coast. He envisioned a system of canals and navigable rivers that would link the Mississippi and the Atlantic via the Potomac. In 1785 he formed the “Patowmack Company” to build this system, obtained the cooperation of the Virginia and Maryland assemblies and pursued his vision energetically until his death. 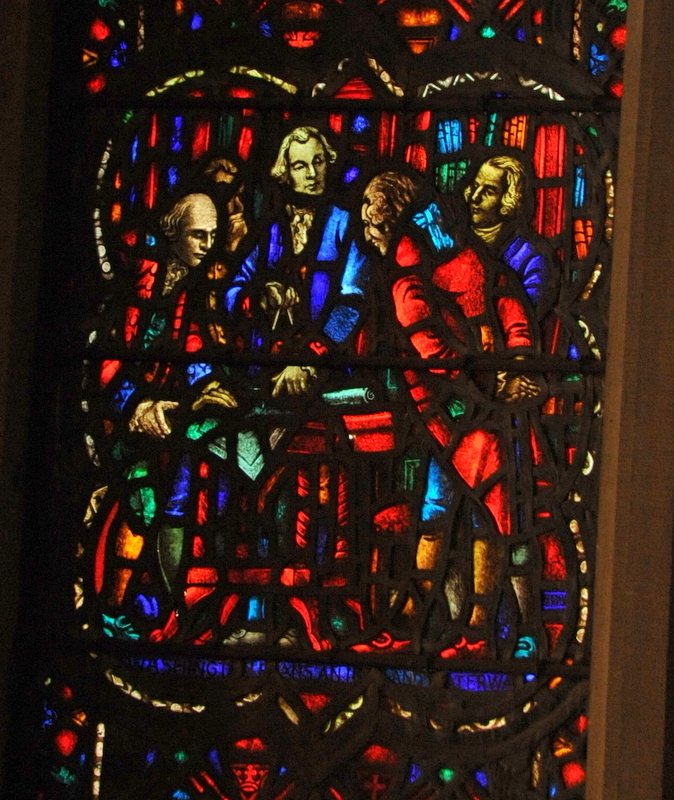 This pane shows Washington in his library at Mount Vernon, compasses in his right hand and pointing with his left to the line of the proposed canal. Pane 12: Jefferson and George Rogers Clark, Dreams of the Winning of the West. George Rogers Clark was the brother of William Clark who was co-leader of the Lewis and Clark expedition in 1804. George, however, had made his own contribution to America’s expansion in 1778-79 when he led a military expedition into what is now Illinois, capturing British forts and towns there and securing the “Old Northwest” for the Americans. George had obtained approval from Virginia Governor Patrick Henry. Thomas Jefferson was apparently consulted as well, but was not the driving force. 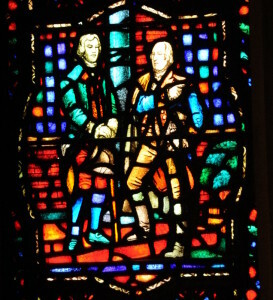 Burk, in his description of the window, writes “[Clark’s] daring scheme to carry American arms into the great Northwest, quickened the pulse and fired the imagination of Jefferson, and was doubtless a factor in that series of events by which Jefferson became the great architect of the Empire of the West.” This pane chronicles that imagined moment in 1778.